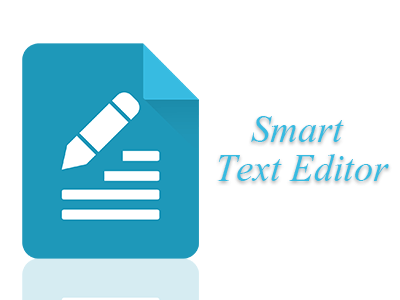 Smart Text Editor is simple app to manage text files effectively and is also a simplest text editor tool for daily life for important notes and other useful text documents. • Syntax Highlight for HTML, XML, CSS, JAVA, JS, PHP and many other languages. • Provide edit mode to make any correction or changes in the file. • Copy, Paste or Cut the content easily and work like notepad app. • Open email attachment file in the app. • One touch option to rename the file. • Sharing text files with anyone via email, bluetooth or any other file sharing options. • Auto Save file option available that will save the file automatically. • Custom themes support available. • Find specific word and also provide option to replace any text. • History of recently opened documents. • Multiple character set encoding options. • Go To Line option available. • Undo and Redo changes easily.